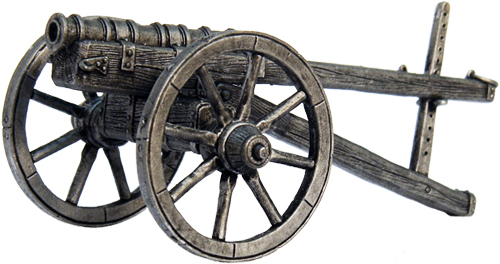 A culverin was a relatively simple ancestor of the musket, and later a medieval cannon, adapted for use by the French in the 15th century, and later adapted for naval use by the English in the late 16th century. The culverin was used to bombard targets from a distance. The weapon had a relatively long barrel and a light construction. The culverin fired solid round shot projectiles with a high muzzle velocity, producing a relatively long range and flat trajectory. Round shot refers to the classic solid spherical cannonball.